... and watch some great exhibition films we’ve made! Travel back in time to the Anglo-Saxon period! Head to the British Library to discover the world of the Anglo-Saxons in Anglo-Saxon Kingdoms: Art, Word, War open until Tuesday 19th February 2019. Explore treasures of the British Library’s collection with beautiful illuminated manuscripts, jewels, myths and legends as well as the Domesday Book in an exhibition spanning over 600 years of medieval history. Join the National Portrait Gallery in celebrating 20 years of their membership scheme and the fun way in which they’ve marked this milestone - by offering six of their members the chance to have their portrait photographed by the talented Tereza Červeňová. 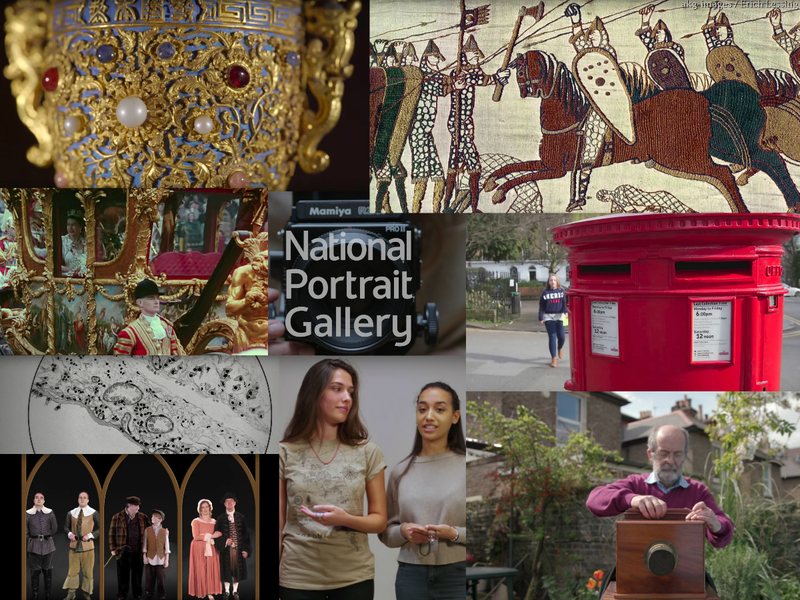 Grab your chance to see this free display of beautiful portraits, and the film we made documenting the project until 10th March 2019. The Horniman Museum and Gardens provides something for everyone; from fossils to flora and fauna, world history and artefacts to the animal kingdom and more. It is a great family day out. In the permanent display at the World Gallery, discover our film documenting the stories of people and the objects that are personal to them. Celebrate 200 years since the birth of the founder of the stunning Wallace Collection, by visiting Sir Richard Wallace: The Collector and explore his life and his vast contribution to our nation’s heritage. At Chocolate Films, we were thrilled to be able to capture the beautiful collection and intricately detailed objects closely on video and are excited for you to see them too! Hurry though, this exhibition closes on the 6th January 2019. Ever wondered how thousands of Christmas cards get delivered each year? Take a trip to the Postal Museum and find out. Situated in Clerkenwell, The Postal Museum reveals the fascinating history of the first social network in a fun and interactive way, perfect for children of all ages! You can even board the Mail Rail Christmas Ride discovering stories and histories with a festive twist. Travel to Harrow, to Headstone Manor & Museum, and be transported back to prehistoric times. Meet Roman potters, Medieval Archbishops through to Victorian gentry and more with an imaginative and exciting immersive video, on display in the newly restored Small Barn. Travel through Harrow’s story in the Grade I listed Manor House, and watch the history of the area come to life! The Museum of London is free to visit and a great place to learn about London’s rich and varied past, from the Neolithic era through to modern day! Our exhibition film for Disease X uncovers what might happen if an unknown pathogen sparked an epidemic. Discover past historic health crises and how scientific research has helped eradicate these, protecting our futures. The Museum of London Docklands explores how the River Thames plays an iconic role in the shaping of the city and its contribution to our maritime past. Slavery, Culture and Collecting is a free display exploring the challenging relationship between European culture and transatlantic slavery, following slave owner and art collector George Hibbert. Understand the story of Roger Fenton, a respected photographer whose published photographs showed the impact of war to the general public for the first time. His images of the Crimean War, taken in 1855 created the genre of war photography with Fenton leading the way in capturing the subject with subtlety and respect. We produced two films showing two fascinating photographic processes - a must for any photographer. Head to Roger Fenton’s Photographs of the Crimea at the Queen’s Gallery, Buckingham Palace now. Soak up the regal atmosphere at the Royal Mews with collections of beautifully ornate historic royal carriages belonging to the Queen and royal family members, see the livery worn by the The Queen’s coachmen and even try out your own carriage! Find our film in the collection to learn more about one of the finest working stables in the world.